Porter Prize is named after Michael E. Porter, an economist, researcher, author, advisor, speaker and teacher. Throughout his career at Harvard Business School, he has brought economic theory and strategy concepts to bear on many of the most challenging problems facing corporations, economies and societies, including market competition and company strategy, economic development, the environment and health care. His research has received numerous awards, and he is the most cited scholar today in economics and business. The award recognizes the corporates in India based on their best strategy management practices. The event is attended by about 200 CXO’s and comprises of thought-provoking panel discussions and keynotes. This year the event is scheduled on September 30, at The Leela, Ambience Island, Gurgaon. 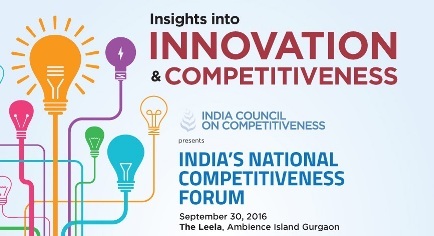 India’s National Competitiveness Forum (NCF) will aslo take place on September 30, 2016 at The Leela, Ambience Island, New Delhi, India, organized by the Council of Competitiveness. The theme for this year’s forum would be innovation and competitiveness. Today it is very important to understand the fundamental drivers of the innovation in the Indian context specifically at the level of states. As noted in the Global Innovation Index 2015, Innovation is no longer an imperative for developed countries alone and developing countries must do their bit in fostering innovation. The Future of the States in India will be driven how they pursue innovation. The forum would be a discussion platform to understand the underlying levers that can act to increase or impede the trajectory of India’s growth and competitiveness.